Distance swimmers possess mental and physical toughness, and they sometimes tease sprinters for being lazy, but swimming sprints takes strength and excellent conditioning. Distance is a relative term when swimming in a pool, but, in general, sprint workouts feature short, intense sets. Endurance workouts might seem more grueling simply because you put in more mileage, but fast sprint sets really test your cardiovascular fitness. Swimming fast takes more than excellent technique. You need explosive strength for speed. Setting the bar high, or rather, the interval low for a 50- or 100-meter sprint forces you to ratchet up your efforts. Strong back muscles and shoulders help you swim freestyle fast, but the makeup of your muscle fibers also matters. Everyone has fast- and slow-twitch muscle fibers. Predictably, the fast-twitch fibers are those you rely on for intense speed. Genetics, rather than training, determines what percentage of fast- versus slow-twitch muscle tissue you have, but sprint training teaches you how best to use these muscles. Swimming is an aerobic sport and relies on a steady supply of oxygen to keep you going in endurance sets. Sprinting doesn't rely on aerobic metabolism of energy. When you go all out in a sprint, the extreme exertion forces you to fuel your stroke with anaerobic metabolism. A fast way to get energy, anaerobic metabolism also produces lactic acid as a byproduct, which produces the painful burning sensation you get at peak and just-past-peak effort. Sprint training at race speeds helps you get used to the discomfort and perform despite it. 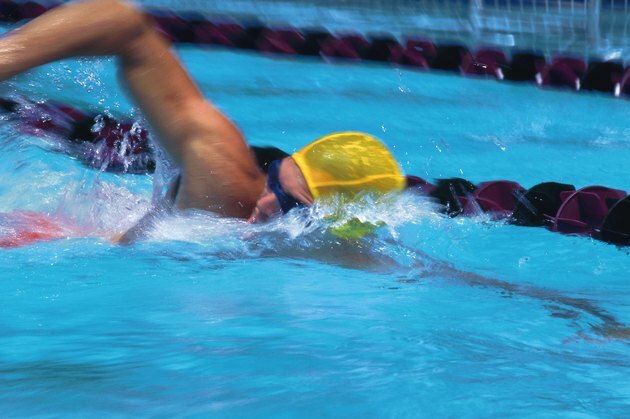 Even if you are not a competitive swimmer, sprint training mixes up your routine, keeping you engaged and energized. Endless laps lead to boredom and muscle fatigue, so adding in some sprint sets can put you back on track physically and mentally. Swimming sprints at your race pace, or best effort, gets you accustomed to the feel of moving fast in the water. When you practice swimming faster, you train your body and mind to swim at a quicker pace even when you are not sprinting. Sprint workouts can be grueling and exhausting, so coaches don't schedule them every day. They mix sprints in with aerobic distance workouts to avoid injury and fatigue. For a basic sprint set, determine a comfortable 100-meter interval, which is the time it takes you to complete 100 meters at a moderate pace. Perform 5 X 100 meters, or five repetitions of 100 meters, decreasing your swim time by five seconds each 100 meters. For example, if your base time is two minutes, your 100-meter times should be 1:55, 1:50, 1:45 and 1:40 minutes. Repeat the set, but stop if you cannot maintain your stroke technique due to fatigue.